Combine goat’s milk powder and french clay and mix well. Add pure essential oil to a small amount of powder mixture till well combined, then add back into the main mix. To use – Mix powder with hydrosol to a very thick paste. 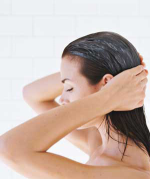 Apply to dry hair and coat thoroughly, ensuring the hair shaft is well coated. Leave till hair is dried – then rinse till hair comes clean. There is no need to shampoo.